What is the first thing you think of when you hear the phrase “office politics”? Does it conjure visions of positive influence and skilled conflict resolution, or images of difficult employees and toxic relationships? No matter your response, one thing is certain: office politics are part of the landscape. 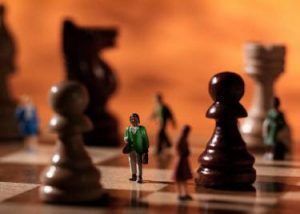 Whether you work for a small, tightly knit company or a global, widely dispersed organization, you will likely encounter bullies, unpleasant people, and a whole host of puzzling co-workers. The truth is, most of us hate office politics. Take Bill and Justine, for example. Together, they had founded a thriving commercial real estate company in a competitive market. They were proud that the company was growing after nearly 10 years. They had survived difficult market cycles while competitors went out of business. Looking to boost their growth and cement their position as a major competitor in the market, they hired a high-powered real estate broker, Stella, who boasted of having a robust business network. Stella looked good on paper, however, her reference checks turned up lukewarm recommendations. Despite the red flag, Bill and Justine plunged ahead with the hire based on the promise of revenue growth. Within the first weeks of the hire, it became apparent that Stella was struggling to fit the company culture. The existing team had been through tough times together. Information was shared openly. The team was accustomed to high standards and worked hard. By contrast, Stella sought out gossip and actively sowed doubt by spreading unfavorable personal stories. Within weeks, the atmosphere felt toxic and tempers were running high. Stella had come from a company culture where management actively fostered bitter competition. Aggression, rudeness to team members, and gossip was the price management was willing to pay for high performance. In their haste to drive revenue, Bill and Justine had overlooked the values that helped them build a successful team and profitable company. Those values included integrity, exceptional client service, competitive spirit, and camaraderie. Join us in the conversation this month, as we solve this and other office politics puzzles. We will brainstorm difficult scenarios to help you politic-proof your current team, and help you uncover the political climate of your next employer during the interview process.